FES International has scooped three new contracts to supply equipment for projects across Europe and South America. 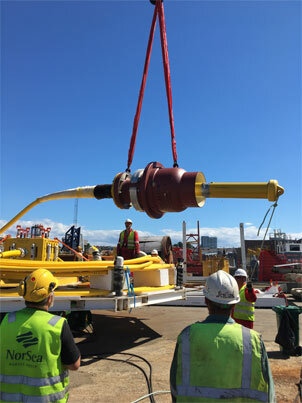 Over the next three years, FES will deploy its Diverless Bend Stiffener Connectors (DBSCs) to projects in Balder, located in the North Sea; Constellations, located in the Gulf of Mexico; and Liza, located in Guyana. Balder (North Sea) – going live this year, this project will see FES engineer install the DBSC male unit to interface with an existing 20 year old client DBSC female unit, which remains subsea, presenting a complex engineering process. Constellations (Gulf of Mexico) – a refurbishment project due to go live this year. Liza (Guyana) – due to go live in 2020, this project is through Exxon. The news comes close behind the order and rapid delivery of another DBSC to Mabruk in the Mediterranean Sea. This project went live last year and saw FES install a winch wire centraliser to successfully engineer an offshore pull-in through a J-tube spool that was 20° – usually 7°. Specific testing and qualification was performed to ensure the higher degree angle was successful. With over 400 connectors supplied, the FES DBSC provides an efficient and safe method of subsea installation of DBSCs. The patented automatic end fitting release system allows for the connection of the bend stiffener and release of the riser/umbilical and end fitting without subsea intervention. The focus on design excellence, quality control and first-class manufacturing has led to FES DBSCs being certified by API as Load Transfer Devices in accordance with API 17L1 – the Specification for Flexible Pipe Ancillary Equipment. Managing Director of FES International, Rob Anderson, said: “We’re delighted that the DBSC continues to be a popular choice for customers around the world. Working closely with our customers to ensure our equipment works for their specific needs has led us to develop sister products within this range, which will be announced later this year. “We work hard to provide our customers with first-class engineering solutions. The FES diverless system provides a very safe and reliable method of connection, which is why our customers continue to choose our products.